Inspired by the Japanese art of paper folding, Endorphina created a slot called Origami. You can win up to 250,000 coins with its Random Multiplier bonus. The famous Japanese art of folding paper to turn them into different shapes and figures is known as “origami.” Nowadays, the practice of this art has spread across the globe and has since influenced many industries. One of these is the iGaming world as seen in the Endorphina slot called Origami. 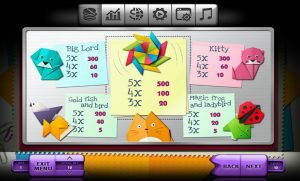 Origami is an animal-themed slot that gives a nod to the well-known art form. You can play this title wherever you go as it is accessible on mobile devices. Know more about what else this game offers you by reading through this in-depth slot review. As soon as you start the slot, you will see cute-looking origami figures on the reels. Some of these are the Green Frog, Pink Panther, Yellow Fish, and Blue Dog. Other icons that grace the game’s reels are the Purple Bird, Red Ladybug, and Colorful Spiral. Meanwhile, the background of the title is a pile of different patterned papers for doing the art. The game will keep you interested with its fun background music. Plus, it features eye-catching animations as you play. Some of these are the different motions that symbols do whenever you land them in a combo. This will entice you to keep on spinning the slot’s reels while anticipating more winning combinations. Origami features five reels spinning around three rows. Also, it has 10 paylines running across that count your winning combos from three directions: left to right, right to left, and the middle. Other than that, the game features a return-to-player percentage of 96%. Place any amount from 0.01 up to 100 coins as your wager before you start spinning the title’s reels. If you prefer hands-free betting, you can do so with the slot’s Auto option. All you have to do is click on it and the reels will spin automatically until you choose to stop it. 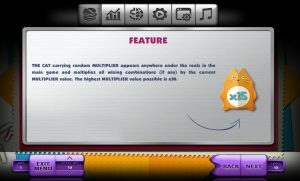 You can expect Origami to offer two features: Random Multiplier and Risk Game. Know more about these in-game bonuses below. There are times when an Orange Cat will pop up from below the reels during your spin. If you win the round, this Orange Cat will multiply your reward to its multiplier. This bonus can grant you a multiplier of up to 50 times. Endorphina’s signature Gamble feature called Risk Game is available in this slot as well. You can double your reward in a round by playing this mini-game. All you have to do is pick a card from four face-down cards and hope that it has a bigger value than the face-up card on the screen. Winning the round grants you twice the amount of your winnings for the round, while losing leaves you with nothing. Other than the abovementioned bonuses, Origami offers a jackpot of 250,000 coins. 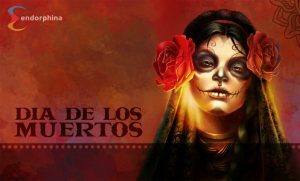 If you are looking for features like free spins and Wilds, though, you will not find any in this slot. 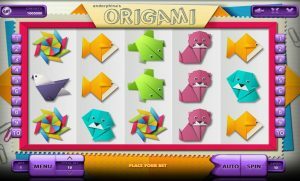 With its cute design, simple gameplay, and satisfying rewards, Origami gives you a great gaming experience even if you are a newbie or a veteran to slots. The game’s wide bet range is also great as it caters to your wagering preferences whether you like placing low bets or going all out. Unfortunately, if you are a fan of Bitcoin slots with the usual features, you might be turned off with this title’s lack of them. However, with the Random Multiplier bonus, you still have a chance of winning the game’s jackpot which is why Origami is still a slot you should definitely try out.